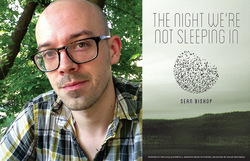 Sean Bishop is the author of The Night We’re Not Sleeping In (Sarabande, 2014), selected by Susan Mitchell as winner of the 2013 Kathryn A. Morton Prize in Poetry. He administers the MFA and Fellowship programs at the University of Wisconsin-Madison’s Program in Creative Writing, where he also teaches creative writing and creative writing pedagogy. He is the founding editor of Better (bettermagazine.org), the former managing editor of Gulf Coast, a former Ruth Lilly Poetry Fellow, and a former Diane Middlebrook Poetry Fellow at the Wisconsin Institute for Creative Writing. His poems have appeared in Alaska Quarterly Review, Best New Poets, Boston Review, Harvard Review, jubilat, Ploughshares, Poetry, and elsewhere.